National Compliance Statement. Lifeguard-Pro is an internationally & nationally recognized Lifeguard, Water Safety Instructor, and CPR & First Aid certification agency. We serve all 50 U.S. states, over 1,500 American cities, and over 30 countries around the world -- so wherever you are, we're nearby! We have been an official Business Affiliate of the American Camp Association (ACA), and have serviced ACA youth camps across the country. Our certified Lifeguards and Water Safety Instructors protect millions of swimmers around the globe -- every day! Our certifications are used across the U.S. and around the world by individuals, businesses, organizations, governments, military, insurance companies, and many more! "World Leader in Water Safety & Rescue"
General Comparison of Lifeguard-Pro and American Red Cross. Essentially, Lifeguard-Pro and American Red Cross are the only real options for a nationally recognized Lifeguard certification. Lifeguard-Pro ended the Lifeguard training monopoly long-held by American Red Cross. As a result, Lifeguard-Pro has increased consumer choice, introduced competitive pricing, and enhanced national public safety by making aquatics public safety training more available. Year after year, Lifeguard-Pro doggedly pursues its mission to reduce the number of deaths by drowning worldwide by increasing the availability of aquatics public safety training. Consequently, Lifeguard-Pro has significantly increased the number of certified Lifeguards across the country and around the world, which makes our aquatics environments undoubtedly safer; and, Lifeguard-Pro Lifeguards now protect the lives of millions of swimmers around the globe -- every day! Lifeguard-Pro Surpasses American Red Cross. 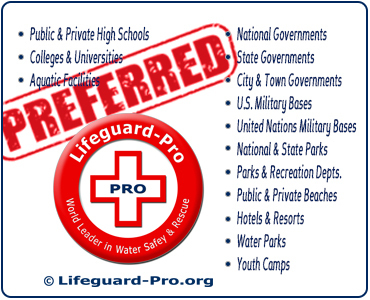 Lifeguard-Pro is accepted in all countries where American Red Cross Lifeguard certifications are accepted. In addition, Lifeguard-Pro is also accepted in many countries where American Red Cross Lifeguard certifications are not accepted. But, Lifeguard-Pro doesn't stop there. In addition to increasing the availability of vital public safety training, and protecting millions of lives daily around the globe, Lifeguard-Pro continuously strives to improve national public safety. Lifeguard-Youth Camp Certification. 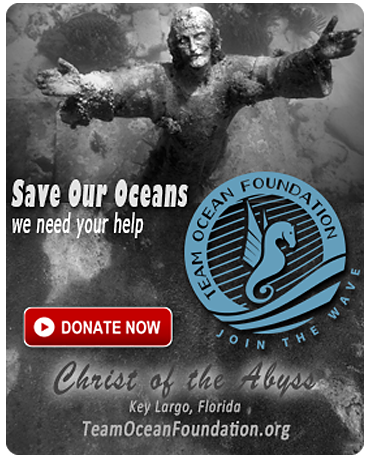 State and local governments have known for a long time that youth camp aquatics activities present unique and serious hazards to children. Yet, despite state and local regulations attempting to reduce those risks, the Lifeguard industry failed to provide a youth camp specific training course to help the states and local governments in achieving the goal of making youth camps safer for our children. Lifeguard-Pro responded with the nationwide public safety answer! To better protect the lives of children, Lifeguard-Pro created the nation’s first Lifeguard–Youth Camp certification course, which trains Lifeguards to better prevent and respond to emergencies in youth camp environments. 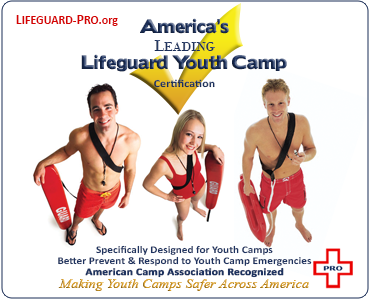 The Lifeguard-Pro Lifeguard-Youth Camp certification protects the lives of children at youth camps across the entire country, and many countries around the world. We worked tirelessly with state and local governments to create a solution to better protect the lives of children at youth camps across the country. Lifeguard-Pro has undoubtedly improved national public safety! Lifeguard-Deep Pool Certification. Previously the Lifeguard industry provided insufficient training to guard the public safety in and around deep water swimming pools and diving catch wells. Lifeguard-Pro acted in creating the nation’s first Lifeguard-Deep Pool (max depth 20 ft.) certification course to better prevent and respond to emergencies in and around deep water pools and diving catch wells. 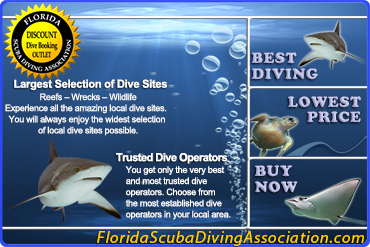 Operators of deep water pools and diving catch wells (e.g., high schools, colleges, universities, etc.) can now better prevent and respond to drownings at their aquatics facilities. Lifeguard-Pro continues to identify and solve national public safety hazards! Detailed Comparison of Lifeguard-Pro and American Red Cross. Lifeguard-Pro was specifically designed to legally satisfy all U.S. state statutes and regulations governing Lifeguard training. 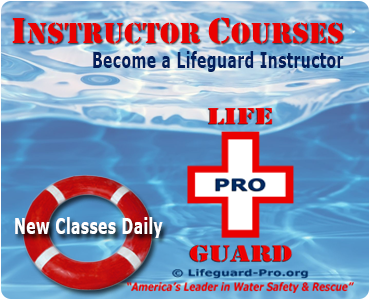 The Lifeguard-Pro Lifeguard course is legally accepted in every state where the American Red Cross Lifeguard course is accepted because the Lifeguard-Pro Lifeguard course includes all the knowledge and every physical skill included in the American Red Cross Lifeguard course. A detailed comparison of the two leading Lifeguard certification programs is provided below. See for yourself why Lifeguard-Pro is the superior Lifeguard certification course! 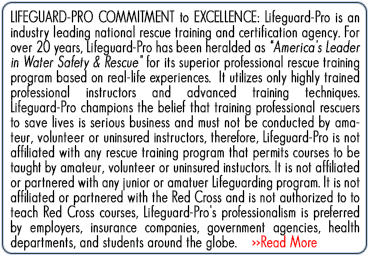 The internationally recognized Lifeguard-Pro Lifeguard certification course is at least “equivalent to the American Red Cross Lifeguard course”. As such, the Lifeguard-Pro Lifeguard certification course should legally and necessarily satisfy all Lifeguard training requirements for employment as a Lifeguard in your state. The Lifeguard-Pro certification course was specifically created to comply with all U.S. state statutes, regulations, and rules that require a Lifeguard certification course to be “equivalent to the American Red Cross lifeguard course”. For all of the following reasons, the Lifeguard-Pro Lifeguard certification course should fully satisfy the standard requiring it to be “equivalent to the American Red Cross lifeguard course”. CPR & AED Training. The Lifeguard-Pro Lifeguard certification course includes the universally accepted American Heart Association CPR & AED for the Healthcare Provider course. All Lifeguard-Pro Instructors teaching this CPR & AED course are fully credentialed American Heart Association BLS Instructors and teach this course in full compliance with all American Heart Association standards and procedures. Lifeguard-Pro Instructors issue graduates of this CPR & AED course an American Heart Association CPR & AED for the Healthcare Provider certification. American Heart Association sets the universal standards for CPR & AED. The Lifeguard-Pro Lifeguard certification course teaches the American Heart Association CPR & AED for the Healthcare Provider course. The American Red Cross (herein after “ARC”) CPR & AED course which is taught in their Lifeguard certification course is CPR for the Professional Rescuer. This ARC CPR & AED course is an imitation of the American Heart Association CPR & AED for the Healthcare Provider course which is taught by Lifeguard-Pro. As such, the ARC CPR & AED training does not include any knowledge, skills, standards or testing that is not included in the Lifeguard-Pro (American Heart Association) CPR & AED training for Lifeguards. Indisputably, the CPR & AED training provided in the Lifeguard-Pro Lifeguard course is at least equivalent to that provided in the ARC Lifeguard course. Therefore, the CPR & AED training provided in the Lifeguard-Pro Lifeguard course should legally and necessarily satisfy the “equivalent to ARC” standard. Every candidate in the Lifeguard-Pro Lifeguard course is taught the exact same CPR & AED knowledge, CPR & AED physical skills, tested in the equivalent manner, and tested to the equivalent standard as the candidates in the ARC Lifeguard course. First Aid Training. The Lifeguard-Pro Lifeguard certification course includes the universally accepted American Heart Association First Aid course. All Lifeguard-Pro Instructors teaching this First Aid course are fully credentialed American Heart Association First Aid Instructors and teach this course in full compliance with all American Heart Association standards and procedures. Lifeguard-Pro Instructors issue graduates of this First Aid course an American Heart Association Heart Saver First Aid certification. American Heart Association sets the universal standards for First Aid. The Lifeguard-Pro Lifeguard certification course teaches the American Heart Association Heart Saver First Aid course. The ARC First Aid Basics course which is taught in their Lifeguard certification course is an imitation of the American Heart Association Heart Saver First Aid course which is taught in the Lifeguard-Pro Lifeguard course. As such, the ARC First Aid training does not include any knowledge, skills, standards or testing that is not included in the Lifeguard-Pro (American Heart Association) First Aid training for Lifeguards. Certainly, the First Aid training provided in the Lifeguard-Pro Lifeguard course is at least equivalent to that provided in the ARC lifeguard course. Therefore, the First Aid training provided in the Lifeguard-Pro Lifeguard course should legally and necessarily satisfy the “equivalent to ARC” standard. Every candidate in the Lifeguard-Pro Lifeguard course is taught the same First Aid knowledge, First Aid physical skills, tested in the equivalent manner, and tested to the equivalent standard as every candidate in the ARC Lifeguard course. Lifeguard Academic Content. The academic content of the Lifeguard-Pro Lifeguard course purposefully includes every bit of knowledge and every principle included in the ARC Lifeguard course. Lifeguard-Pro intentionally included all of the information included in the ARC Lifeguard course, so that the Lifeguard-Pro course would legally and necessarily satisfy the “equivalent to the ARC” nationwide standard. Ultimately, there is no information contained in the ARC Lifeguard course that is not contained in the Lifeguard-Pro course. 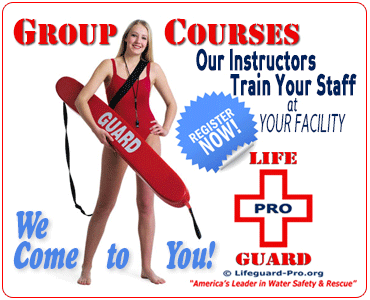 The Lifeguard-Pro Lifeguard course includes the entire academic content of the ARC Lifeguard course. Consequently, the academic content of the Lifeguard-Pro Lifeguard course is equivalent to the ARC Lifeguard course. Therefore, the Lifeguard academic content of the Lifeguard-Pro Lifeguard course should legally and necessarily satisfy the “equivalent to ARC” standard. Every candidate in the Lifeguard-Pro Lifeguard course is taught the exact same knowledge as every candidate in the ARC Lifeguard course. Lifeguard Academic Testing. The Lifeguard-Pro Lifeguard course requires all certification candidates to pass written exams demonstrating their mastery of the academic content of the course. The breadth and depth of the Lifeguard-Pro Lifeguard course written testing component is at least as comprehensive as the ARC course. The minimum passing grade of the Lifeguard-Pro Lifeguard written testing component is at least as high as the ARC course. In other words, the Lifeguard-Pro Lifeguard course requires all certification candidates to demonstrate written mastery over the same academic content as the ARC Lifeguard course, and requires all candidates to achieve at least the same score as required by the ARC Lifeguard course. All academic information that is tested with written exams in the ARC Lifeguard course is also tested with written exams in the Lifeguard-Pro Lifeguard course. Clearly, the Lifeguard academic testing required by the Lifeguard-Pro Lifeguard course is equivalent to that required by the ARC Lifeguard course. Therefore, the Lifeguard academic testing required by the Lifeguard-Pro Lifeguard course should legally and necessarily satisfy the “equivalent to ARC” standard. Every candidate in the Lifeguard-Pro Lifeguard course is tested with written exams on the same knowledge and in the same manner as every candidate in the ARC Lifeguard course. Lifeguard Physical Skills Requirement. Every single physical skill taught in the ARC Lifeguard course is also taught in the Lifeguard-Pro course. There is no physical skill required by the ARC course that is not also required by the Lifeguard-Pro course. To be clear, the Lifeguard-Pro Lifeguard course includes the every single physical skill included in the ARC Lifeguard course. Obviously, the Lifeguard-Pro Lifeguard course and the ARC Lifeguard course require equivalent physical skills. Therefore, the Lifeguard physical skills required by the Lifeguard-Pro Lifeguard course should legally and necessarily satisfy the “equivalent to ARC” standard. Every candidate in the Lifeguard-Pro Lifeguard course is taught every physical skill that every candidate in the ARC Lifeguard course is taught. Lifeguard Physical Skills Testing. The Lifeguard-Pro Lifeguard course tests all candidates’ mastery of the exact same physical skills as the ARC Lifeguard course. Both agencies test mastery of the required physical skills by using the same PASS/FAIL standard. For every required physical skill, both agencies share the exact same definition of what constitutes a PASS and what constitutes a FAIL. Evidently, the Lifeguard-Pro Lifeguard course and the ARC Lifeguard course require equivalent physical skills, grade physical skills performance on an equivalent scale, and use equivalent physical skill definitions for competency. Therefore, the Lifeguard physical skills testing required by the Lifeguard-Pro Lifeguard course should legally and necessarily satisfy the “equivalent to ARC” standard. Every candidate in the Lifeguard-Pro Lifeguard course is tested on the exact same physical skills; evaluated on the same PASS/FAIL grading scale; and, must achieve at least the exact same level of proficiency for every physical skill as candidates of the ARC Lifeguard course. Lifeguard Training Time. The Lifeguard-Pro Lifeguard course affords its candidates with at least the same number of training hours the ARC Lifeguard course affords its candidates. The Lifeguard-Pro Lifeguard course provides and estimated combined 24.0 hours of online and in-person training to all course candidates. Simply put, the Lifeguard-Pro Lifeguard course and ARC Lifeguard course are of equivalent duration. Therefore, the duration of the Lifeguard-Pro Lifeguard course training legally and necessarily satisfies the “equivalent to ARC” standard. Every candidate in the Lifeguard-Pro Lifeguard course is trained for at least the same duration as every candidate in the ARC Lifeguard course. Lifeguard Instructional Staff. Instructors of the Lifeguard-Pro Lifeguard certification course have been trained to at least the same proficiency standards as the instructors of the ARC Lifeguard course. Satisfactorily taught at least two full Lifeguard-Pro Lifeguard certification courses under the direct supervision of a Lifeguard-Pro Lifeguard Instructor Trainer. Simply put, the Lifeguard-Pro Lifeguard Instructor training is equivalent to the ARC Lifeguard Instructor training. Therefore, the Lifeguard-Pro Lifeguard Instructor training should legally and necessarily satisfy the “equivalent to ARC” standard. Every Lifeguard-Pro Lifeguard Instructor is trained to at least the same competency and professional standard as ARC Lifeguard Instructors are trained. Date on which certification expires. The Lifeguard-Pro International Certification Verification Database is online and accessible to everyone. Employers, Department of Health Inspectors, Insurance Companies, Government Officials, and other interested parties can, with a few clicks of a computer mouse, verify the authenticity and details of any Lifeguard-Pro Lifeguard cardholder’s certification from anywhere in the world. To conduct a query, the searching party only needs to input the student’s name and unique certification card number which is printed on the certification card. 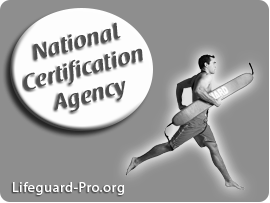 The Lifeguard-Pro International Certification Verification Database minimizes fraud, forgery, lapses in certification, and provides an easy to use method to the public to verify the authenticity of any Lifeguard-Pro Lifeguard certification. Clearly, the Lifeguard-Pro’s online, state-of-the-art, centralized Lifeguard certification record-keeping database is at least equivalent to the ARC’s hundreds of manual offline county record-keeping databases. Therefore, the Lifeguard-Pro centralized Lifeguard certification record-keeping database should legally and necessarily satisfy the “equivalent to ARC” standard. Every Lifeguard-Pro Lifeguard certification record is stored for verification and authentication purposes in at least an equivalent manner to the ARC Lifeguard certification records. Quality Assurance. The ARC Lifeguard course issues 2-year certifications to graduates of their program, and then does not re-train, re-test, review or even supervise cardholders' performance in-person for 2 years. The Lifeguard-Pro Lifeguard course issues 1-year certifications to graduates of their program, and then requires all cardholders to refresh, review, and practice all of the course knowledge and physical skills on a monthly basis. After 1 year, every Lifeguard-Pro cardholder must be fully re-tested, re-trained, and re-certified in-person by Lifeguard-Pro to perpetuate their Lifeguard certification. In short, Lifeguard-Pro requires Lifeguards to participate in at least twice the amount of annual Lifeguard training, plus additional monthly training. Similarly, the ARC Lifeguard course relies solely on a statement from the lone ARC Lifeguard course Instructor to ensure that every candidate has satisfactorily completed all required course work. Lifeguard-Pro adds additional training quality assurance measures by requiring that both the Lifeguard Instructor and candidate attest in writing that the candidate has satisfactorily completed all required course work. In other words, the Lifeguard-Pro Lifeguard course requires at least double the verification that the Lifeguard candidate has satisfactorily completed all required course work. The Lifeguard-Pro Lifeguard course Instructor and candidate must both initial every single skill definition that the candidate completed competently and confidently at least three times in the presence of the Lifeguard Instructor. The Lifeguard-Pro Lifeguard course Instructor and candidate must both sign a statement that he/she is confident that the candidate can perform each of these required skills in a real-life emergency. The Lifeguard-Pro candidate has every one of his/her exam answers recorded, graded, and stored in the Lifeguard-Pro centralized database to document that every student has successfully completed all course required academic testing. The candidate must sign an “Oath of Professional Responsibility” stating that the candidate will, on a monthly basis, review the course teaching materials, practice the required course physical skills, and participate in on-site in-service Lifeguard training at his/her place of employment. Lifeguard-Pro warns Lifeguard candidates that during the duration of their 1-year certification, employers, Department of Health Inspectors, insurance representatives, government officials, and even the public may go to Lifeguard-Pro.org and select VERIFY CERTIFICATION to report any unprofessional, negligent or reckless conduct committed by any Lifeguard-Pro Lifeguard certification cardholder. Lifeguard-Pro further warns all Lifeguard-Pro Lifeguard cardholders that any such complaint could result in immediate termination of their Lifeguard certification. Certainly, the Lifeguard-Pro Lifeguard course advanced quality assurance measures are at least equivalent to the ARC Lifeguard course’s scant quality assurance measures. Therefore, the Lifeguard-Pro Lifeguard course quality assurance measures should legally and necessarily satisfy the “equivalent to ARC” standard. Every Lifeguard-Pro Lifeguard candidate is subjected to advance quality assurance measures that are at least equivalent to the ARC Lifeguard course basic quality assurance measures.